This week the challenge is Something New! What is new on my card? I have used a new stamp set from Wplus9 holiday release called Holiday Boughs. I bought this set and never opened it. So this is a new set for me. Then I tried a new style of stamping on my card. Its the stationery style stamping. May Park does this style beautifully. I have seen many of her videos and wanted to try it out. Mayholic in Crafts is her blog. Check out her videos. She is amazing! I started with gold embossing the sentiment from Strictly Sentiment 5 stamp set from Wplus9. I masked a border around the edges of the panel. Then I started my stamping the images from Holiday Boughs, Botanical Bunch and Happy Mail stamp sets in black. I kept all the images inside the masked area. Some of the images are solid images and some are outline. I coloured the outline images with copic markers, adding a little shading. I then removed the mask. I then adhered this panel on to green card base. No embellishment what so ever. 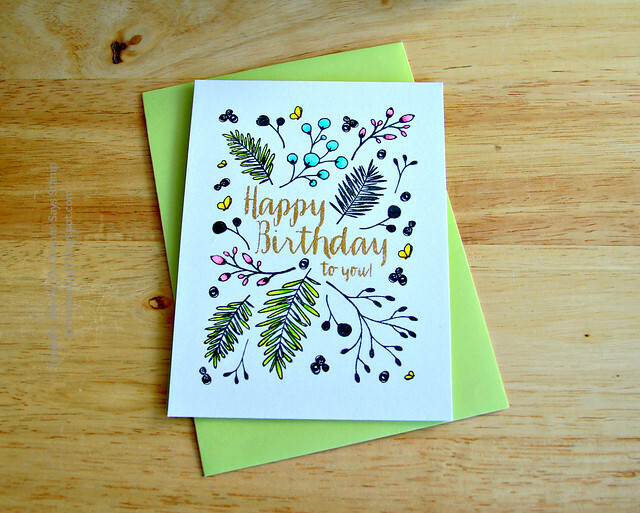 A one layer flat card – Stationery style! Here is another shot of the card. I really love this one layer stationery style card. I will do a bit more experimenting with this style. Hope you like it. Wow your card is really pretty! always love doodle drawings! thanks for always inspiring! ABSOLUTELY gorgeous! I love this! Such a clever design, and just beautiful! I don't think I've heard this term before, but I love the way it looks, Gayatri! Must go read up on it! Totally gorgeous, Gayatri! This looks like something you could find in a stationery store! 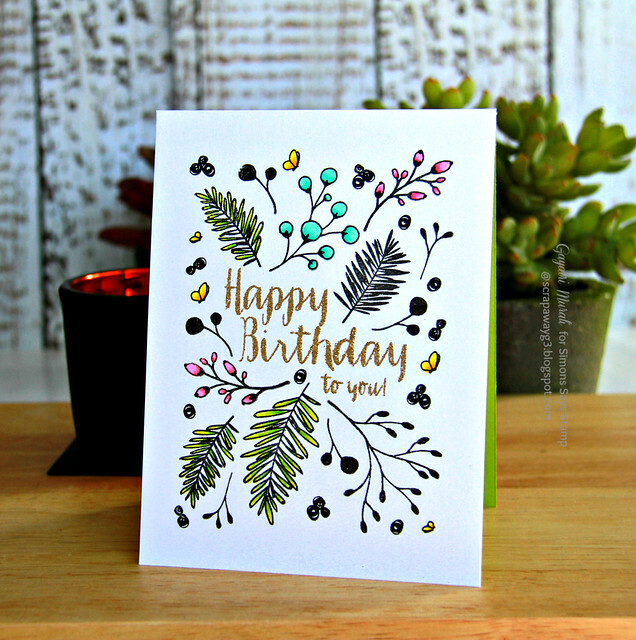 A gorgeous card Gayatri, I love how you fave arranged ferns and berries – such lovely coloured and a super gold sentiment panel!! hi Gayatri! luv this sweet CAS card, very pretty! hope you have a wonderful weekend! WOW!! This is Stunning!! Very talented! !